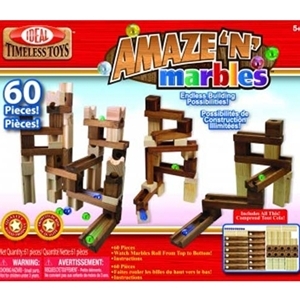 This marble construction set by Ideal® is perfect for your budding engineer! Made of sturdy wood, this 60 piece set includes all kids need to create endless combinations of marble mazes! The solid hardwood blocks feature groves and holes for constructing loads of different tunnels and chutes! Amaze-N-Marbles is perfect for helping kids develop basic learning, organizational, visualization, and coordination skills! This classic hands-on toy will entertain kids for hours, parents may even want to join in on the fun! Perfect for rainy days, play dates, and more! This construction toy includes marbles and is designed for kids ages 5 and up!